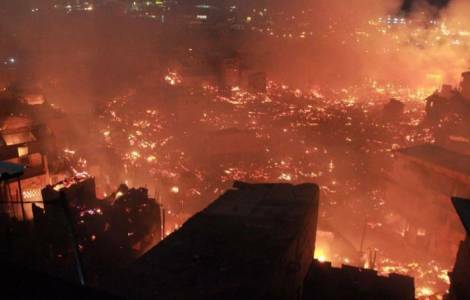 Manaus (Agenzia Fides) - Around 8 pm on Monday 17 December, a serious fire broke out in the Educandos district, in the southern part of the city of Manaus, which destroyed around 600 houses in the district, according to data from the Civil Defense. People had to leave their homes without being able to take anything, to be safe in the face of the rapid spread of fire. After more than four hours of intense work, the firefighters managed to control the fire. The parish of Our Lady of Perpetual Help, led by the Redemptorist Missionaries of the Redemptorist Vice-Province of Manaus, immediately started to welcome the victims of the tragedy, as did other churches and adjacent schools. Father José Amarildo Luciano da Silva, recently appointed Vice Provincial of the Vice Province of Manaus of the Redemptorist Congregation and parish priest of Perpetual Help, informs Agenzia Fides that despite the few resources of the parish, faithful and volunteers have succeeded in making the parish a reception center for victims who have lost everything.